Buy AZ Alkmaar Tickets Now! AZ Alkmaar 2018/19 Tickets Are Available! Founded: 1967. Nickname: Cheeseheads. All Time Top Goal Scorer: Kees Kist (259). Based In: Alkmaar. President: René Neelissen. Overall Most Appearances: Michael Buskermolen (399). League: Eredivisie. Manager: John van den Brom. Main Rivals: Ajax, Telstar, Haarlem. Venue: AFAS Stadium. Captain: Guus Til. Major Honors: 2-Times Eredivisie Winners | 4-Times KNVB Cup Winners | 1-Time Johan Cruyff Shield Winners. Kit Manufacturer: Under Armor. Colors: Red and White. Key Players: Stijn Wuytens, Ron Vlaar, Marco Bizot. Main Sponsor: AFAS Software. Team Mascot: Herry & Berry. Last Season: Eredivisie: 3rd Place | KNVB Cup: Runners-up. Manager Alex Pastor ceased cooperation with the club two days after his appointment. In 1981, AZ became the only team other than the "big three" of Ajax, Feyenoord and PSV which won Eredivisie. In the late 1970s and early '80s AZ '67 were successful, regularly playing European Сups. 2-Times Eredivisie Winners: 1981, 2009. 3-Times Eerste Divisie Winners: 1960, 1996, 1998. 4-Times KNVB Cup Winners: 1978, 1981, 1982, 2013. 1-Time Johan Cruyff Shield Winners: 2009. AZ Goalkeepers: Marco Bizot, Rody de Boer, Piet Velthuizen, Jasper Schendelaar, Joey Roggeveen. AZ Defenders: Jonas Svensson, Henri Weigelt, Ron Vlaar, Thomas Ouwejan, Pantelis Hatzidiakos, Leon Bergsma, Owen Wijndal, Stijn Wuytens, Ricardo van Rhijn. AZ Midfielder: Fredrik Midtsjo, Teun Koopmeiners, Guus Til, Jeremy Helmer, Marko Vejinovic, Mats Seuntjens, Tijjani Reijnders, Adam Maher. 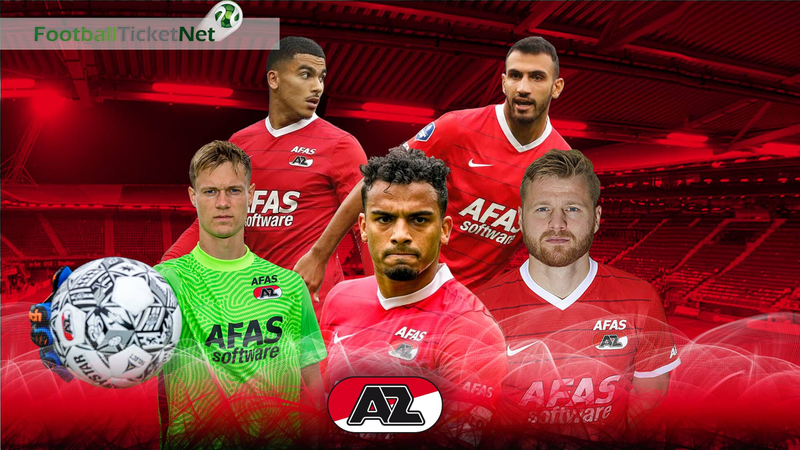 AZ Forwards: Calvin Stengs, Bjorn Maars Johnsen, Oussama Idrissi, Dorin Rotariu, Myron Boadu, Ondrej Mihalik, Albert Gudmundsson. AZ vs AFC Ajax tickets | AZ vs ADO Den Haag tickets | AZ vs De Graafschap tickets | AZ vs Emmen tickets | AZ vs Excelsior tickets | AZ vs Feyenoord tickets | AZ vs Fortuna Sittard tickets | AZ vs Groningen tickets | ADO Den Haag vs Heerenveen tickets | AZ vs Heracles Almelo tickets | AZ vs NAC Breda tickets | AZ vs PEC Zwolle tickets | AZ vs PSV tickets | AZ vs Utrecht tickets | AZ vs Vitesse tickets | AZ vs VVV-Venlo tickets | AZ vs Willem II tickets. Football Ticket Net offers all AZ Alkmaar home & away fixtures for 2018/19. Please browse through the selection of tickets on offfer and choose the right ones for you. The choice is huge. Please be aware that all AZ Alkmaar fixtures are subject to change date and time, which is out of our control. Please note that Football Ticket Net is not connected to AZ Alkmaar or to any official organization such as the or Dutch Eredivisie.